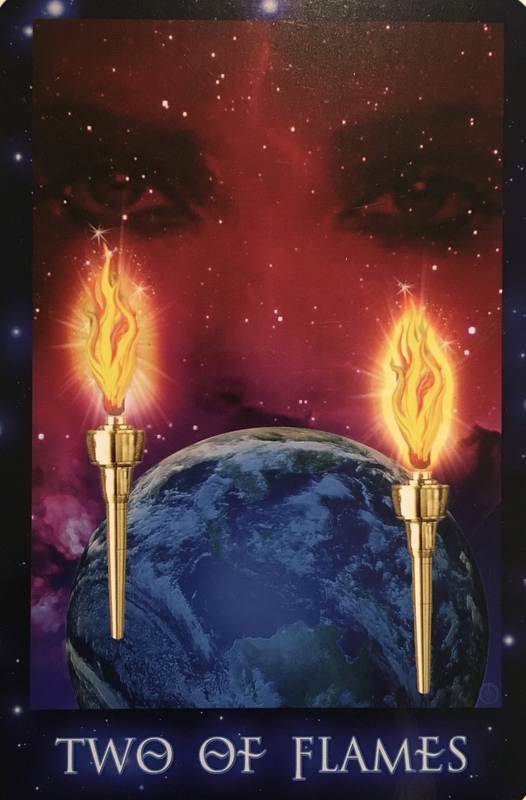 Two of Flames: “The Two of Flames is about recognizing more than one option and determining the best way to move the creative flow forward, for the good of the one and the all – and making it manifest on Earth. From the perspective of one’s individual process, it speaks to the querent of choosing the right path that will lead to dominion and materialization of the creative, inspired process. To the many inspired spirit warriors and light workers who have come to take part in the Earth in transition, it also illustrates how the Starseed intention to serve as a leader or guide at this time will require reflection, discernment, and an understanding of how focused intent is the tool of leadership, which brings spirit into manifestation. This card is about truth. Finding and living your truth to the best of your ability; and working to hone that ability over time. Clarity is required; what is it that you wish to manifest, and is it held by your Higher Self to be for the Highest Good of All? Then this is the way forward. Letting go of the material realm in favour of a spiritual quest. Releasing the bonds put upon us by society; those of accumulation, of consumption and of hierarchy. Releasing the fears of failure and judgment if we don’t fit in to the ‘normal’ ways of Being in the world. Releasing doubts of whether we can be successful in life if we chose the path our heart whispers to us is the right path, but society deems not. Balancing responsibility and obligation with passion and dedication to our true Soul path. Despite the fact that it makes those closest to us uncomfortable. Despite the chaos going on around us. Listening to our Higher Self for guidance instead of asking the opinions of others, who may project their own fears upon us and inadvertently or purposefully sidetrack us. Following our intuition and instincts each and every moment of each and every day. Watching for signs, messages, symbols in our awake time and our dreaming. This is how you decide which direction to take. Surrounding yourself with nature. Surrounding yourself with those you can trust; your soul group of supportive and like minded people. Releasing the old, the negative and the toxic with love and compassion, holding space in your heart for their healing. Coming together with those who can offer their unconditional love and acceptance. Take it slowly, mindfully. But take action. In your heart of hearts, you know what you must do.